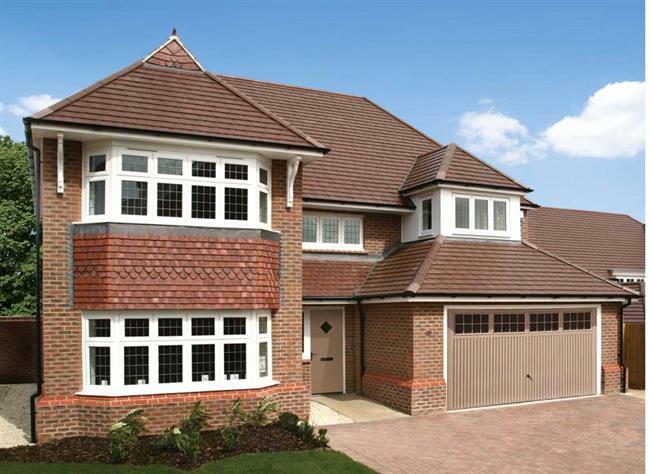 4 Bedroom Detached House For Sale in Woking, Surrey for Guide Price £879,950. This attractive bay fronted family home marries its period external features seamlessly with the most stylish and contemporary interiors and has been designed and crafted to ensure there is a wealth to live and grow into. Upon entering this lovely home through the covered front porch the internal finish really sets itself apart. Ahead of you the door opens into the stunning, light and airy open plan kitchen with a dining area and family room adjacent on either side, both of these rooms are complemented with their own individual glazed doors bring the rear garden into its own. To the front of the property you will find a generous bay fronted sitting room on one side of the house and the large double garage on the other. The ground floor also offers a separate utility room and side access to the house and a cloak room. The first floor reconfirms the space and accommodation with a galleried landing, 4 double bedrooms, 2 en-suites and a lovely family bathroom. The Master Bedroom located to the front of the property benefits from the additional space the feature bay fronted window has to offer along with a separate walk in wardrobe and contemporary en-suite. Bedroom two also offers a contemporary en-suite and with the addition of two further double bedrooms and the family bathroom. Working in London doesn’t mean you have to live in the city. Kings Hundred is a delightful place to set up home, situated in open countryside, four miles to the west of Woking, in the village of Bisley, yet it is just 35 minutes from London by train from nearby Brookwood Station, making your commute quick and easy. Bisley brings you the best of both worlds, with plenty of open spaces and greenery, yet all the facilities of the town within easy reach, as well as all of the opportunities and attractions of the city. Which makes it the perfect place for our Heritage Collection homes, which themselves give you the best of both, with traditional Arts and Crafts inspired architecture and family friendly modern interiors. Each property will have its own garden. AGENTS NOTE: The external photos shown are CGI's and provide an illustration of the houses being built. Internal images shown are of the show home or of similar property and may not be a true representation of the exact property shown.